Long time no see, I hope all is well with all of you. Once again, I apologize for my lack of blog posts lately. Like all of our lives, mine has been filled with tons of chaos, both good and bad. But, I'm back with a bang and ready to give you a review that you'll never forget! I know that you'll all end up wanting these products!!! As I mentioned in my last post, finding the right hair care products has always been a struggle of mine. Some left my hair too oily while others made my hair flat and lifeless. If you want to read more details about my hair type and the various natural hair care items that I've tried in the past, read the 'My Story' section on my latest post. Either way, I never settled for less or gave up looking, I am both happy and relieved to say that I have found my dream hair care and skin care product company. I know that many people say that they have found their favorite hair care product, but continue to try more. But, I can officially say, that I will never go back to any other brand as long as this company is still around. Their company is truly amazing! Their concoctions are a gift from the heavens and I am not exaggerating one bit! I am speechless and in shock of how great their products are. I hear many people say that it is important to vary your hair care (specifically shampoo and conditioner) and not continuously use the same shampoo for a while, as your hair will get used to it and no longer reap its benefits. However, this claim only applies to shampoos and conditioners filled with various chemicals. These chemicals (including, sodium lauryl sulfate, dimethicone, and sodium EDTA etc) strip your hair and scalp of its natural oils and can in turn damage it. These chemically filled products might work at first, but will eventually damage your hair. For this reason, you will have to (or are recommended to) switch to another brand of shampoo (one that your hair has not yet been damaged by) in order to "restore" your hair back to its healthy state. This constant chemical shampoo/hair care switch then becomes a deadly cycle. The unnatural shampoos coat your hair in chemicals to diminish the damage. But once your hair gets used to the chemicals reaction, it becomes damaged again and you have no choice but to switch to a different chemically composed product to solve the problem. If you switch to another unnatural shampoo, the same damage pattern will happen to your hair. But, if you switch to a natural shampoo, you hair will be restored and no switch will ever need to be made again. In other words, your hair will never be fully restored unless you switch to a more natural based shampoo that will nourish your hair. When you find a natural shampoo made with good quality ingredients and is chemical free, you will never have to switch to another shampoo, as your hair will be constantly nourished and will never be damaged from chemicals again. I hear so many of my friends say that they have not yet found a good shampoo for their hair type. The truth is, regardless of your hair type, a good quality natural shampoo and conditioner (in this case, Calia's) will work for you and nourish your luscious locks regardless of what you consider your hair-type to be. 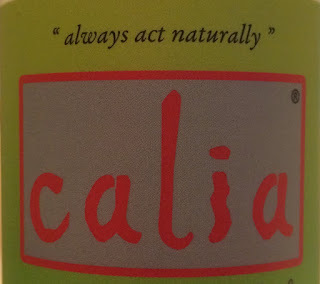 This company goes by the name of Calia. Other than making the most wonderful products, they have a beautiful motto, 'Always act naturally.' Calia was started by Randall Cunningham who desired to create natural skin and hair care products without using harsh chemicals. He focuses on only using ingredients sourced from nature to provide the best benefits to both ones skin and hair. They are a small, independent company located on Canada's West Coast, and aim to assist their customers with their skin and hair care needs. The company's main focus is to create natural high quality hair and skin care. Calia is also made up of a wonderful team. I spoke to Randy myself and can say that he is the most friendliest person I have ever spoken to. Shira McDermott, who handles their social media and responds to most emails that you send through their website, is very friendly and will always respond quickly to your emails and answer all your questions. Out of all the customer service I've received over the years, theirs is by far the best. They truly want to help you achieve a more natural lifestyle as well as help your skin and hair care needs. They commit to giving you the best sourced ingredients possible and 'always act naturally' in doing so. All their magical items can be purchased on their site, www.calianatural.com. Their website is very user friendly and extremely well organized. Even a non-technologically savvy person like myself can navigate it. If you are lucky and live in the lower mainland of Canada, their items can be purchased in Urban Fare, Save on Foods, PriceSmart food etc. Calia's products are also offered at other retailers which can be easily found on their website. I purchase all my Calia products online and they arrived to me within a week of purchase. As for the items pictured, the Hydrating Shampoo and Conditioner and the Balancing Shampoo and Conditioner are 360mL and each cost a reasonable price of $14.49. You can purchase a smaller 240mL size of the same items for $10.99 or their largest size, a 4 liter bottle for $105.00. 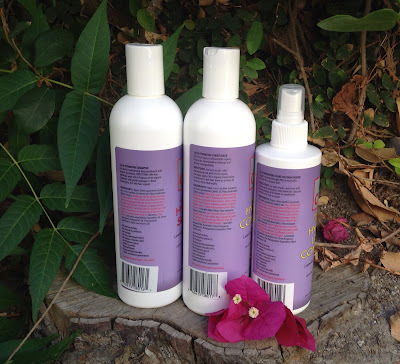 Their Hydrating and Balancing leave-in conditioner spray both are 240mL and cost $10.99. If you want to get more of a deal or try more than one line, Calia offers special packages that are a great way to save money and try a variety of their products. I always purchase their package deals, as you get more of a variety. You might think that their items are a bit pricey, but a little bit goes a long way and their products are made from the highest quality ingredients (which are all listed on their website). You also do not need to wash your hair as often when using these products. That definitely saves money!!! Just to add, Calia recently came out with a Purifying line, but I'm saving those products for another review post. I could just go on and on about benefits of these products. I HAVE ABSOLUTELY NOTHING NEGATIVE TO SAY! Their products have transformed my hair for the better. They have made my hair soft, more manageable, clean, non-greasy, moisturized, hydrated, healthy and the list goes on. I can honestly say that I will never go back to another company for my hair or skin care needs. When I have kids in the future, this is company that their hair and skin products will come from. I trust no one else, and that is saying a lot. Their products are gentle, great for sensitive skin, mildy scented and do what they say they will. They even offer a fragrance free line and children's 2in1shampoo and body wash in case you have sensitive skin or are sensitive to essential oils. Furthermore, their scented products are only scented with natural and organic essential oils. All their items are made with the same base, but scented differently with different essential oils. Their Hydrating line is scented with Lavender, Bergamot and Rose Geranium essential oils, while their Balancing line is scented with Cedarwood and Rosewood essential oils. The Hydrating line smells like a lavish floral garden, while the Balancing line smells like a light woodsy rain forest. Both lines are unisex, which is great! I love both lines equally, as they both do their job. 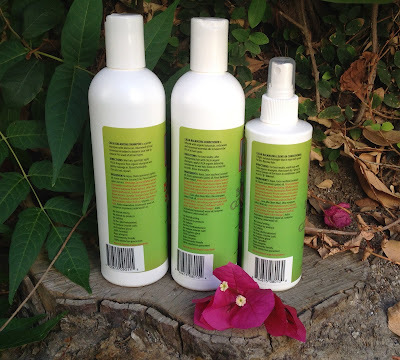 The Hydrating line moisturizes my long locks and the Balancing line gives my hair a deep clean and ensures that the naturals oils from my scalp are evenly balanced. But, both lines have made my hair extremely healthy and super soft. The leave-in conditioner sprays (both hydrating and balancing) add even more nourishment, smoothness and a pleasant smell to my luscious locks. 1.) Like any standard shampoo, I wet my hair, pour a small quarter size amount of the shampoo into my hand and work it into a lather on my hair and scalp, from root to tip. After some intense rubbing and a scalp massage, I thoroughly rinse out all remnants of the shampoo. And trust me, I have medium to long hair, you only need a small amount. 2.) After rinsing out all the shampoo, I pour out a quarter size amount of the conditioner and apply it all over my hair, focusing mainly on my ends. I then leave it in my hair for about three minutes or longer, while I wash my body (and shave if necessary). After I finish washing my body, I thoroughly wash out any remaining conditioner. 3.) When I exit the shower, I lightly towel dry my hair and spray a few spritzes of either the Hydrating or Balancing leave in conditioner spray and gently comb my hair through with a wooden wide-tooth comb. -Beautiful and easy to use packaging. -Cleans hair very well without stripping it of its natural oils. -So effective in such a short period of time. -Paraben, SLS free and overall chemical free. All ingredients come straight from nature. -Rinses clean and does not leave an oily residue whatsoever. 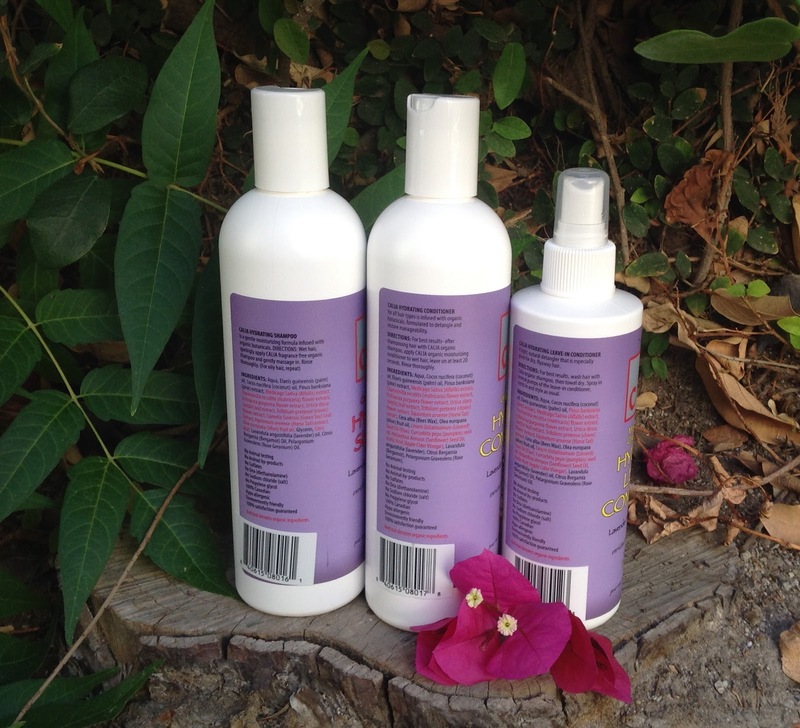 -Makes your hair super smooth, soft, manageable and overall healthy. -Detangles your most knotted hair. -Detangles hair like nothing you have ever used. -Makes your very soft and thoroughly nourished. NONE WHATSOEVER! I know it seems a bit strange that a product doesn't have a negative side, but none of their products have anything negative about them. 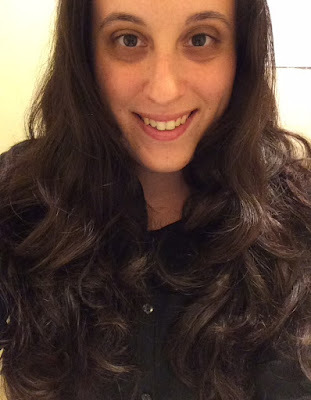 Look at how my hair looks (see picture below) after using just their Hydrating line (shampoo, conditioner and leave-in conditioner spray) and air/towel drying it; I never use heat! Their products have done wonders for my hair and have boosted my self confidence and self esteem. I am an honest person and will always tell the truth about a product (see my last post). 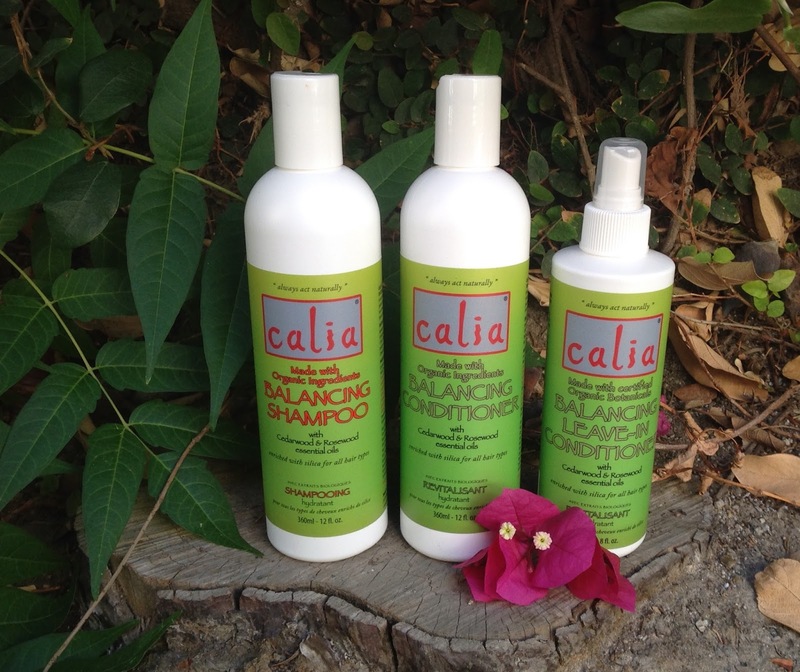 Calia's products truly rank high and reign supreme! The only con, would be having to choose between the Hydrating and Balancing line, as they are both so amazing! I think you all know my thoughts by now. Calia is truly the best of the best! I give all 6 products 5 out of 5 petals, as they all perform beautifully. I hope that Randy and his fellow Calia team members continue to make new and exciting products and be around for eternity. They are making magic! I just can't wait to see what they have in store next. 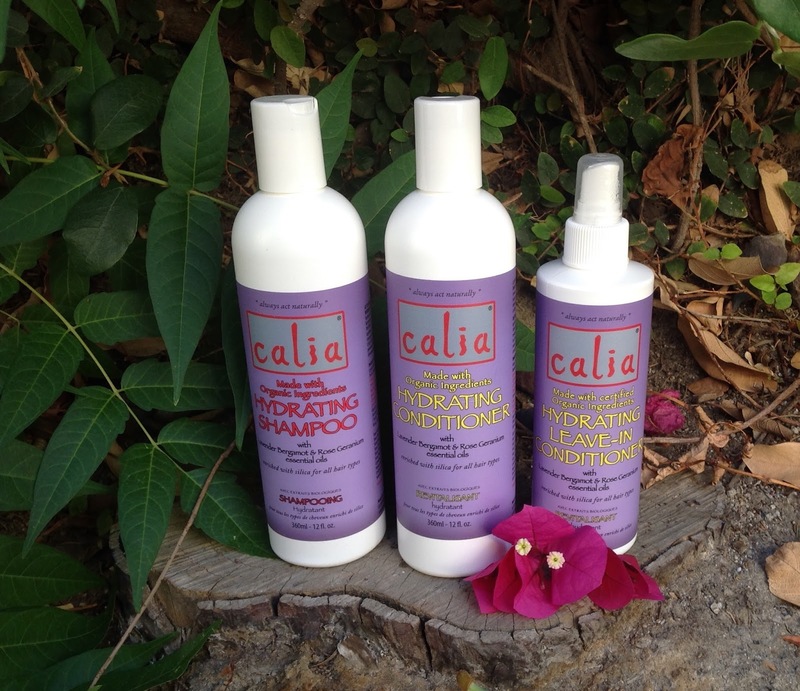 Stay tuned for my next post..."Calia Natural Hair Care Review: Purifying Collection"
In the mean time, stay happy, healthy and active! Feel free to leave any comments and questions below. Note: All opinions are my own. When giving reviews, I am always honest and will not sugar coat anything, GUARANTEED! I've tried out the Fresh Water moisturizing shampoo and conditioner and it smelled really good! I really enjoyed this set and will eventually buy it again. I've also tried the Argan Oil leave-in conditioner, but I found that didn't do much for my hair. I never tried any of the fresh water hair products. But, if you say that they smell good, I must give them a try! Thanks for checking out my post! I live in Switzerland and have also heard of Calia and ordered the violet one. Let's see if this brings something against my dry feeble hair. This is fantastic, a great read - enjoy the distribution of puns too. Keep them coming. Loved the chemist warehouse observation. If you want to smooth hair please see this blog. Hey. U have color treated hair. Do you know if this shampoo is safe for color treated hair. I want to protect the color but like natural products, however my experience with natural shampoos has been horrible. Hi, thanks for checking out my review! Interesting product, thank you for sharing, I would like to try this and see how it will help my hair. A fascinating discussion is worth comment. There's no doubt that that you ought to publish more on this issue, it may not be a taboo matter but usually people do not discuss such topics. To the next! Cheers!! Thanks for the review! I will be definitely getting a Calia brand shampoo and comditioner for sure! I have a question though. I used to use a narural shampoo for a period of many months. My hair had become healthier,but I stoped using the shampoo due to it looking flat and oily in some areas. Would purifying shampoo be better for me or balancing? Thanks! I'm Jewish myself! 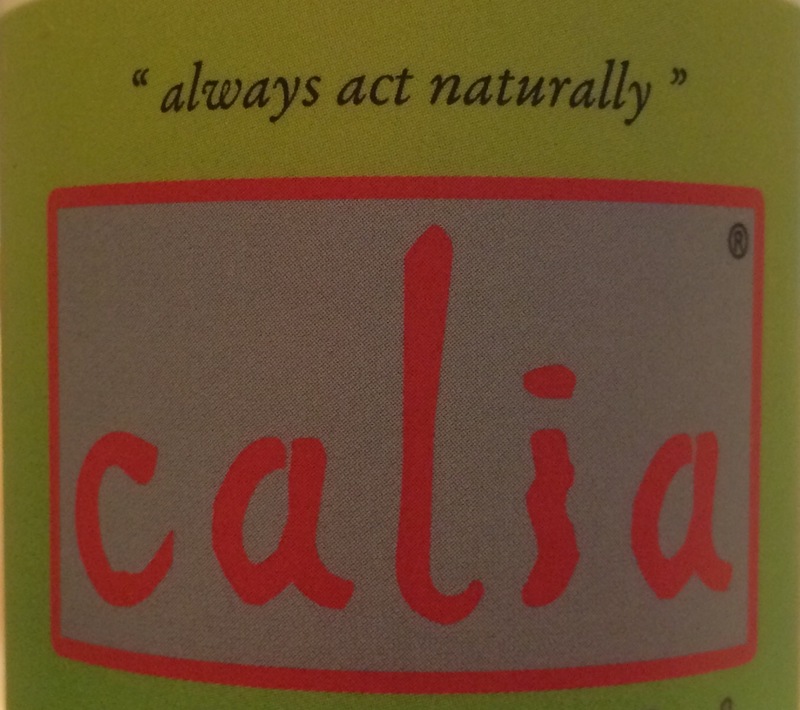 :-) Calia's hair and skincare is something special. They work woderfully for all hair types. I think that the hydrating line is best for curly hair. I have wavy hair and the hydrating line is my favorite! In terms of the skin cream, lotion and body milk, it depends how much moisturization you are looking for. The skin cream is the most thick and moisturizing. The body milk is very thin and perfect for light moisturizing. The body lotion consistency is medium-thick and moisturizing. All of their moisturizers are amazing!